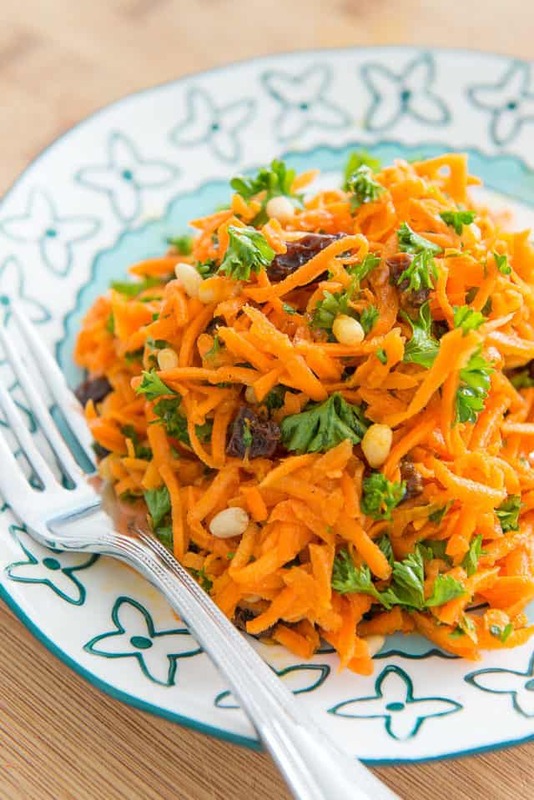 This gorgeously vibrant Carrot Raisin Salad is full of flavor and simple to prepare. It’s a great make-ahead dish too, as it only gets better as it sits. If you’re looking for a pretty and delicious side dish that holds up well for picnics, potlucks, and parties, this is the recipe for you! I absolutely adore picnics and do them often in the summer. I even have a post for Picnic & Potluck Recipes so I can quickly scan through ideas for what I’d like to pack. I love the marriage of eating a meal with spending time outside, and I think there is something so restorative about it for the body and soul. Does it sound a bit romantic? Maybe. But if you ask me, picnicking is totally underrated as an activity. It’s free but still manages to feel so special. 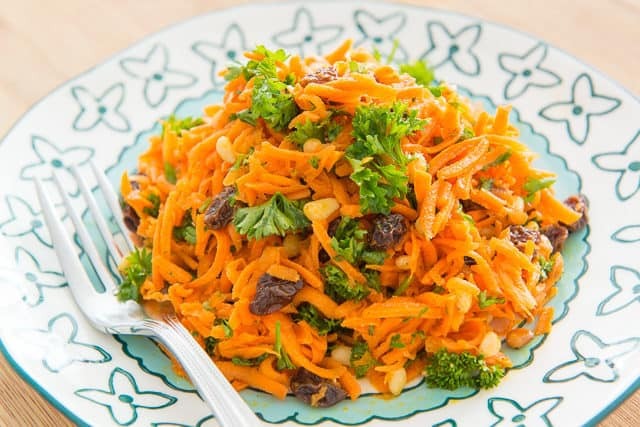 Lately I’ve been making a personal effort to come up with more fresh salad and vegetable ideas, and this Carrot Raisin Salad is one of my new favorite dishes. It’s perfect picnic food, as it keeps really well, but is also really refreshing to eat in warm weather. You can also serve it at a party in a big decorative bowl, or in little party glasses. The salad is worthy of entertaining, and so beautiful, vibrant, fresh and flavorful. I recently had my little brother and a few friends over, and everyone devoured it. Not that I have anything against mayonnaise, but it’s nice to have this carrot and raisin salad without mayo. The spices and carrots shine through a bit more that way. 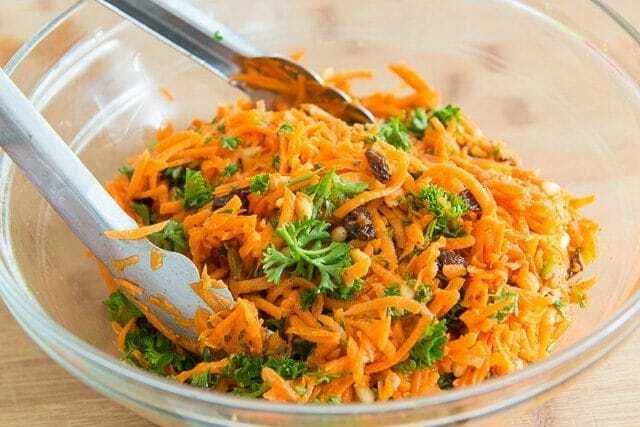 Ordinarily I use flat Italian parsley for all my cooking, but I like to use curly parsley for this carrot salad because I love how they look like carrot tops! 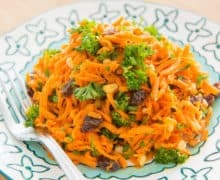 Like most non-lettuce salads, the carrot salad is best when it has been allowed to sit for at least an hour, so the flavors can meld together. This is a great fresh side dish to enjoy with bruschetta chicken and tabbouleh, or on its own. 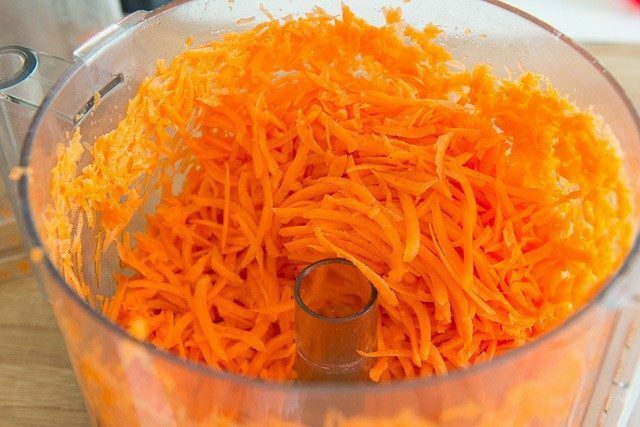 Wash and peel the carrots, then shred them using the shredding disk of a food processor. You could also use a grater but that might take a while. 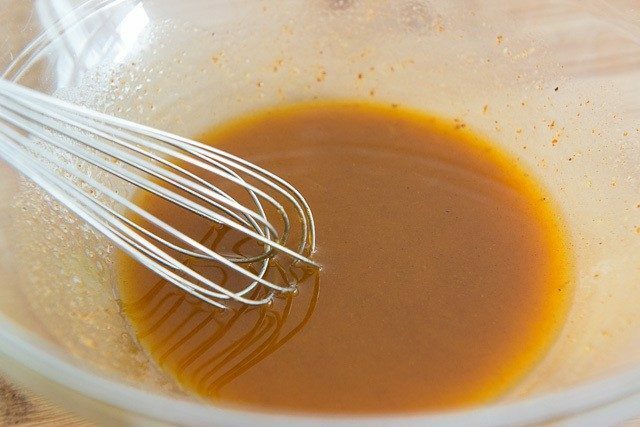 In a large bowl, whisk to combine the olive oil, lemon juice, dijon mustard, honey, cinnamon, paprika, cumin, salt, and pepper to taste. 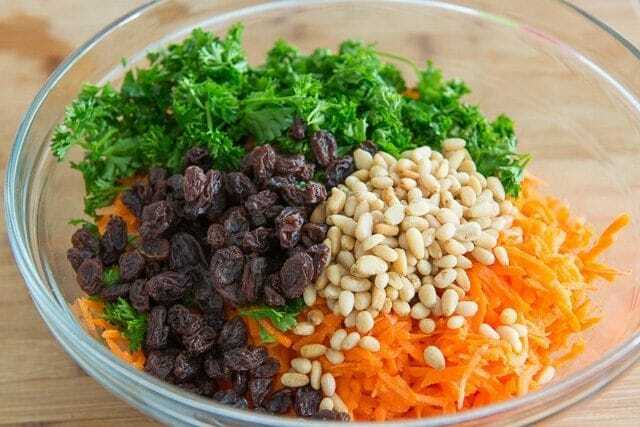 Add the shredded carrots, pine nuts, raisins, and parsley. Toss well to coat. If possible, let the dish rest for an hour before serving, either at room temperature or in the refrigerator, so the flavors can meld. Enjoy! The carrot salad will keep for 2-3 days in the refrigerator. 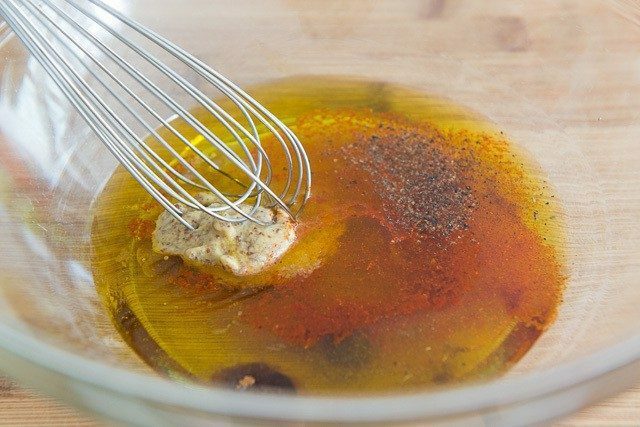 *Use a fruity and sweet olive oil. Don’t use a bitter or robust one like an Arbequina. This is indeed perfect for a picnic! I love the flavors.